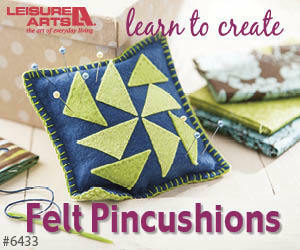 Did you know that distractions can affect your efficiency in your quilt studio? And by distractions, I’m not necessarily talking about getting a notification every time one of your friends posts on Facebook or Instagram – although that can be a huge distraction. 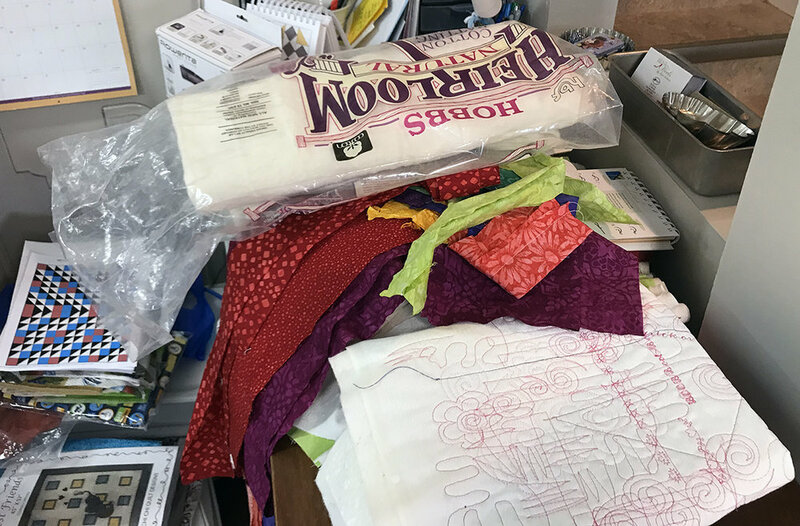 Let’s talk about what other types of distractions can be affecting your quilting productivity and how to avoid them. Take a look around your quilt studio. Is everything in its place or are there WIP’s, fabric and books lying around? Okay, maybe that’s just my studio, but I’m sure that yours is sometimes in this state too. If having a messy studio bothers you, it can affect your ability to be efficient in your studio. If there is fabric on my pressing surface that has been there ever since I bought it at the quilt show a month ago, this is a major distraction for me. I might be stitching away on a project, but once I catch a glimpse of this fabric pile, I start getting distracted. This visual distraction prevents me from working on my current project as I keep thinking, “I really need to fold this fabric and get it into my fabric stash”. This desire to put away the fabric is in the back of my mind as I am trying to work on my quilt project, distracting me which makes me less efficient. If I wanted to avoid this scenario, I should really put this fabric away as soon as I get home from the quilt show, but this never happens. It languishes on my cutting or pressing surface, getting moved around whenever I need these areas for their proper activities. This also happens with books, patterns and magazines in my studio. I may’ve leafed through them, but I want to take a closer look when I have more time, so I leave them out on my sewing table or another area in my quilt studio. I’m afraid that if I put them away, I’ll forget about them or forget which book or magazine had that fantastic pattern in it. Again, I really should put them away after making a note of the books or magazines that I want to refer back to when I have the time. Leaving items like these out, rather than putting them away, not only takes up working space, but creates a visual distraction. Seeing them takes your mind away from your current project and can make you feel guilty or overwhelmed. These are one type of visual distraction that can be easily remedied, by putting them away, but there is another type of visual distraction that isn’t so easily dealt with. The décor of your quilt studio can also be a visual distraction. If you’re the type of person who needs clean space around you, yet have lots of decorative items in your studio, this might be causing you to be distracted and unable to focus on your current project. 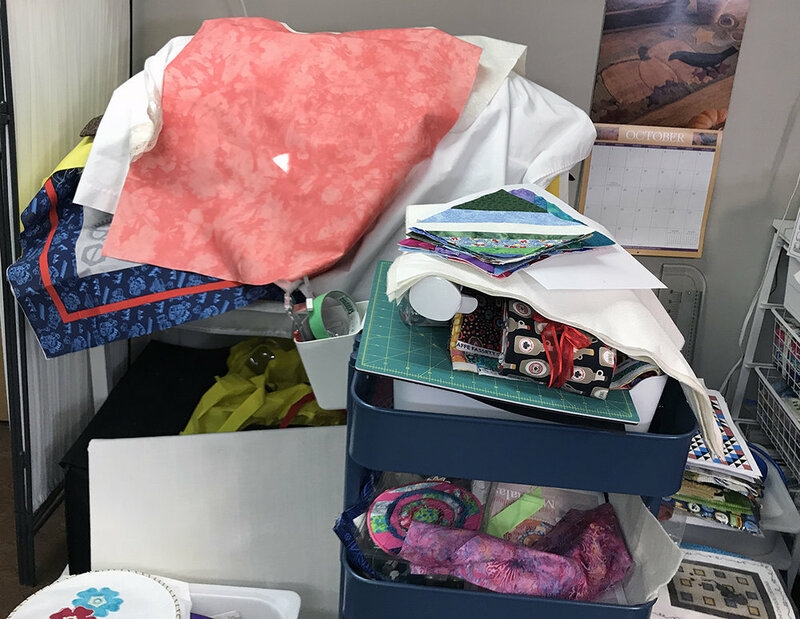 If you have a large window in your quilting space, this can provide wonderful lighting, but if you are constantly looking to see what’s going on outside, this distraction can interrupt your quilting time. 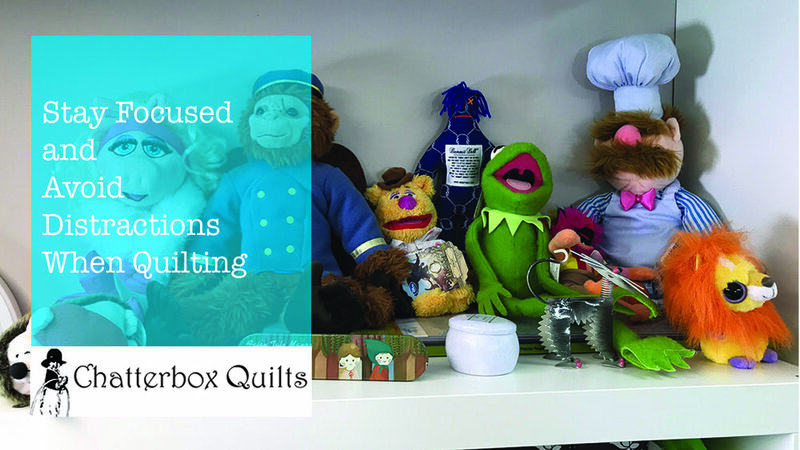 Click on the image below for a video on distractions in your quilt studio and how to avoid them. Do you have distractions in your quilt studio that are affecting your efficiency? Let me know in the Comments below.